To download the Greek version please click here. Clean fuel is one of global shipping’s hottest topics as the International Maritime Organisation (IMO) 2020 deadline for a global sulphur limit in fuel oil used on board ships is fast approaching. And as European Commissioner for Transport Violeta Bulc stated in her speech during last night’s official opening ceremony of Posidonia 2018, the world’s most prestigious shipping trade event, the European Union’s ‘Vision of Zero Emissions from transport by 2050’, would have additional long-term implications for shipowners worldwide. Indeed, the future of maritime transport is inescapably linked with the welfare of people and the planet. This is why a global approach on decarbonisation and environmental sustainability is very much a hot topic on the exhibition floor at Posidonia 2018, where shipbuilders, engine manufacturers and scrubber providers are showcasing their clean fuel plans and strategies vying to attract the attention of shipowners and fleet operators. But how are the big players from the Far East positioned in the race for clean fuel supremacy? 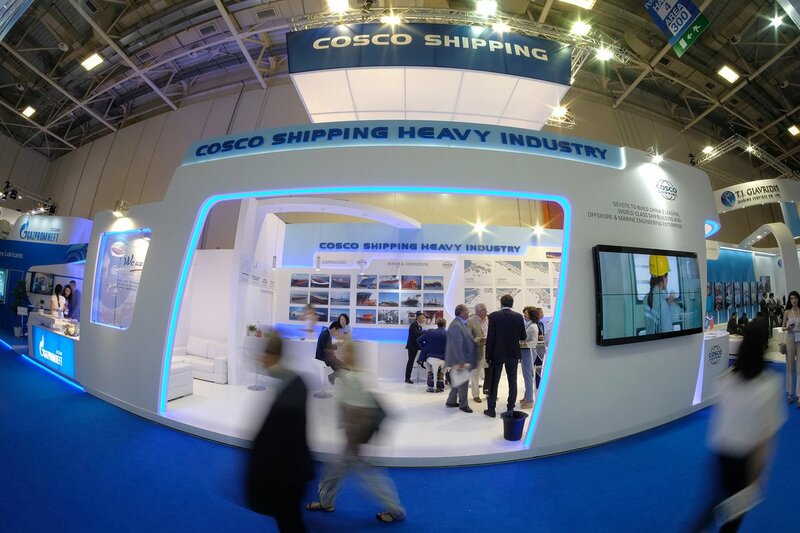 China, Japan and Korea, who hold impressive newbuilding order pipelines from European and Greek shipowners, have once again fielded their impressive Pavilions at Posidonia with the imposing presence of their shipbuilding companies. Tohru Kitamura, Executive Vice President of Mitsubishi Shipbuilding Company said: “We are already prepared for the installation of LNG fuel vessel for various types of vessel, but in Japan the domestic Japanese owners have not decided yet which way to go, LNG fuel, crude fuel or other types of fuel. “At least 4,500 vessels belong to domestic owners and of the total newbuilding order book of Mitsubishi, international shipowners account for less than half of our production. “At Mitsubishi we have various kinds of technologies regarding fuel for example ethanol and LPG fuel. Kitamura was speaking at Posidonia 2018 where he signed a Letter of Intent with China’s Cosco Shipping for the manufacturing of a new scrubber demo test facility. Also at Posidonia today, a new LNG Bunkering project, ‘probunkers’, was launched. The multimillion dollar global-scale project offers the opportunity to invest in two fundamental and dynamic industries, Shipping and Energy. The newly-formed company will design, build and operate a fleet of modern, eco-friendly LNG bunkering vessels to brace the ever-changing needs of global shipping. The project involves: Planning, Financing, Implementation, Operations and Sales. It will have a three-tier role, as Physical supplier, LNG Trader/Seller and Barge owner and operator. The three-fold business model includes investment, trading and finance elements. The multi-layer model involves operations, LNG buying and selling, logistics and marketing. Posidonia 2018 is being held from June 4 – 8 at the Athens Metropolitan Expo. The event is organised under the auspices of the Ministry of Maritime Affairs & Insular Policy, the Union of Greek Shipowners and the Hellenic Chamber of Shipping and with the support of the Municipality of Piraeus and the Greek Shipping Co-operation Committee.